HAVING a strong website presence is important for businesses and individuals in all niches and industries. Whether you are trying to drive traffic to your DIY blog, or trying to boost your retail sales, getting website growth takes time and focus. However, there are things you can do right now to start growing your website traffic immediately. Keep reading to check out the six things you can do TODAY to start increasing your website traffic. Creating an editorial planner for your website is one of the most effective methods of creating traffic growth. Creating a plan is how you turn your goals into a reality. It takes a vague goal, (such as increasing website traffic) and turns it into easy-to-follow steps you can take to see the change you are looking for. A prioritized list of what you are publishing on your website, based on the content strategy you have come up with. A list of the people (if you are working with a team) who will be responsible for the content. Targeted publishing dates for each piece of content, as well as a general timeline to ensure all deadlines are met. Creating an editorial planner for your website is especially important if you have incorporated a blog into your site. Keeping your blog post topics organized, along with their post deadlines, will help your blog run smoothly and efficiently. The more content you produce, the more people will see it. The more people see your content, the more website traffic you will have. If you don’t already have some Pinterest-optimized photos for sharing your website content, you are definitely missing out on huge opportunities for increasing your website’s traffic. Pinterest has over 100 million active users, giving you the opportunity to expand your audience reach. Spend some time creating a few different templates you can easily modify and use for future posts. Sites like Canva make this super easy, and save a lot of time. The site has plenty of pre-made layouts with the dimensions already figured out for you. It’s also a good idea to stay active by joining at least two group boards, pinning content from others, verifying your website URL, and commenting on the content of others. Increase your profile views by choosing a profile picture that suits your brand, adding descriptive keywords to your profile name and description, and making sure your boards complement your brand. A business plan is like a map for completing your goals. It’s an incredibly important part of increasing website traffic because it will help you treat your website/blog like the business you want it to be. It will also give you a clear picture of how you want to promote your website, and help you take it to the next level. Furthermore, having a business plan will give you a way to track your progress and keep you on track. Step 1: Summarize your website’s mission statement in a few short sentences. This will help you come up with practical ways to accomplish the goals you have set for yourself and your business. Step 2: Describe your ideal customer or reader. What are they like? What are they into? Laying all of this information out, and pairing it with your mission statement, makes it easier to see what type of content you need to be producing. 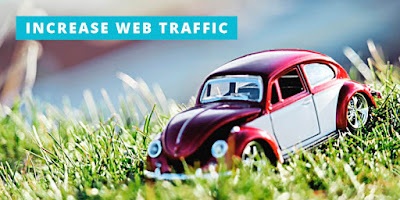 Doing this will bring in the type of readers and customers you wish to attract, and you will start to see a significant increase in website traffic. Step 3: Create a budget for your website. Not only is this an effective way to track your expenses, but the information is definitely helpful come tax season. Step 4: Create a promotion strategy. How are you going to promote on social media? Which platforms do you intend to use? It’s important to spend at least 10 minutes each day on the platforms of your choice, interacting and promoting your site. Additionally, it’s also important to work on building up your email list and marketing your business. If you have been following along, and implementing steps 1 through 3, then you are well on your way to increasing your website traffic. Now, it’s time to schedule your website content in your editorial planner. Something that demonstrates your value, such as: eBook, how-to-guide, template, etc. Interactions with at least five other website blogs and business owners. Not only will this increase your online community, but it will also boost your audience engagement. If you leave valuable comments on the blogs and social media posts of others, people will be included to click through to your website. Create a new email campaign to send out to your readers. Stay updated on the latest email marketing trends, and find ways to implement them into your own marketing. Add a blog to your website, and offer quality content. As of the final quarter of 2015, Twitter averaged a staggering 305 million monthly active users. With numbers like that, it’s easy to see why Twitter is a great resource for website promotion. Choose a username that is easy to read, memorable, and that relates back to your website. The best idea is to use the name of your website. If you are your own personal brand, then using your name is the best method. Fill out all the fields in your profile. This will make you look more credible and authoritative, and will also help people find you when they conduct searches. Make sure to include your website’s URL within your profile. This will drive traffic back to your website. Choose a picture that relates to your website, and is consistent with your brand. Examples include: The logo of your business, a picture of your store, or a photo of yourself. Compose a few good tweets before you start promoting your website. Interact with others, and share (quality) content from others within your industry and niche. That last bit takes us to the final step in increasing your website traffic – finding your business niche. People are far more likely to go to a specialist than a generalist, so niching down is a great way to increase your website traffic. Make a list of the subjects you know really well, and that directly relate to your business. Now, narrow down that list to the things you find to be the most interesting. Finally, cut that list down to the things that prove the most marketable. That is your niche. The more specific your business is, the more you will be able to attract prospective customers and/or clients. If you found this piece useful, please, share it on social media bellow. Share your ways of increasing website traffcie in comments..